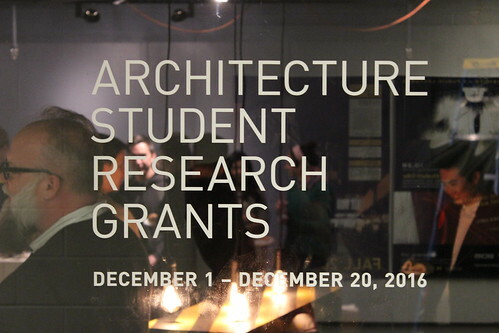 Each year, graduating architecture students honor their class by funding the Architecture Student Research Grant. The tradition, initiated by the Class of 2013, provides a unique opportunity for students to support outstanding research projects by their peers. Projects were proposed from both graduate and undergraduate architecture students. A jury of current and former students selected the winners. The 2016 jury was headed by Tommy Kyung-Tae Nam and included Jayne Choi, Eunsung Cho, Tafhim Rahman, Ian Ting, Y-Nhi Tran, and Diana Tsai, and was advised by Associate Professor Robert Adams. The projects were then researched over a period of months and presented to the College through brief lectures and an exhibition. The presentation was on Wednesday, November 30, 2016; the exhibition was on view December 1 – December 20, 2016 in the College Gallery. ASRG is additionally funded from the proceeds of the Beaux Arts and Bauhaus Balls, matched by the architecture chair, and by the George G. Brigham Student Research Fund. PROLOGUE In Peter Sloterdijk’s Terror from the Air, Sloterdijk claims that the 20th century does not truly begin until April 22nd 1915. On this day, the Germans initiated the first chemical warfare attack on enemy troops. According to Sloterdijk, this act would ultimately send the century down a path of terrorism, environmental targeting, and a need for responsive design. STRUCTURE This research proposal aims to chronologically depict a century of conflict (1915-2016) through an analysis of the tangible and metaphysical voids created by conflicts and the subsequent architectural response. Our research will be divided into four chapters each with their own implication of conflict and the resultant void(s). INTENT The realization of this research grant will consist of both a book which graphically maps and threads a narrative of events ranging from the First World War to the recent activities of ISIS in Europe, and an exhibition of our curated representational artwork. Through graphic representation we will investigate specific acts of aggression and their endemic effects. These will be realized through the mapping of both two- and three-dimensional representation. Given the recent events in Brussels and Paris and the increasing presence of terrorism, our project seeks to reveal architectural agency manifested as a result of social and literal ruin. THIS - a page, a screen, some text, or perhaps an image. THAT-an implied psychology of interaction with the visual world. THIS - an object, a chair, a playground, a ball. THAT-implied choreographies of spatial interaction between body and surface. THIS - a wooden chair, inviting to the touch, rigidly supporting our bodies. THAT-inflated bulbous fabric, the uncertainty of support, the comfort of moldability. The destabilization of these perceptions through the hijacking of both materiality and iconography allows us to open up new possibilities of interaction. Forms of unusual substance and structure are deployed and notation attempts to choreograph our bodies. THIS - A soft form appears, our hands desire to touch. In the absence of that desire the image of a hand-print lures it in. THAT- Our feet are buried under a sea of tiny columns. We are uncertain to tread. A set of footprints show us the way. The notational role of iconography then begins to choreograph an experience through a destabilized and unfamiliar realm. Previously established logics of form and structure fade... we are simply left with THIS and THAT. purely visual realm, certain sensorial affects are lost. Conventional drawing techniques are not readily capable of expressing the non-visual sensorial textures of architecture. The relationship between non-visual sensation and architecture is traditionally explored through architecture’s relationship to music. The composer Iannis Xenakis famously collaborated with Le Corbusier on the monastery at La Tourette. Steven Holl’s work with the Architectonics of Music seek to manifest this relationship in a contemporary setting. Both of these instantiations suffer from the same critical weakness: the systems for translating music into architecture are opaque and subjective. This makes them difficult to be used consistently as a design technique. We propose to create a clear language of translation of sensorial information into architectural representation. Through this language, architects could design using scents, sounds or taste. We will deploy the language to document Buckminster Fuller’s Dymaxion House. Unique in its open plan, the house defines discrete spaces through sensorial experiences. The house relies on atmospheres to define space. Its location at the Henry Ford museum allows for first-hand research. will publish our findings and a how-to manual of translation in book and web formats, so that this system can be used in the future by architects wanting to render sensorial experiences.